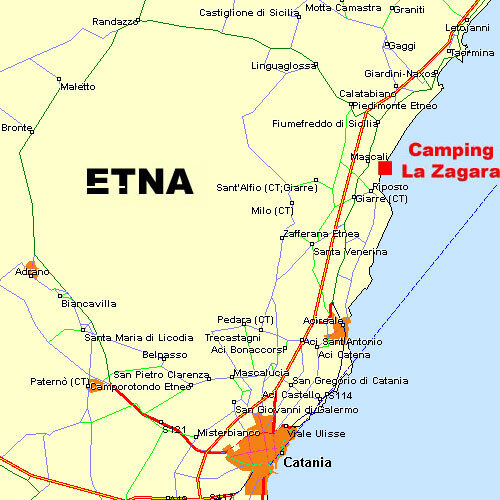 The Camping La Zagara is situated in a charming place where Na ture has lavished generously its goods. Geographically, it is located in a very strategic position, among the most charming Sicilian tourist sites and towns, well worth of visiting such as the enchanting and marvellous town of Taormina, the stunning Alcancantara Gorges; the highly interesting baroque town of Acireale; the Volcano Etna with its interesting Park and the very nice Piedmontese villages and towns; the town of St. Alfio with its millenary Chestnut tree; the Riviera dei Ciclopi, with the town of Acicastello and the fishing village of Acitrezza. The Camping La Zagara offers a full range of facilities to suit every requirement. It has: play park, restaurant, pizzeria, bar with foodstuffs shop, Equipped Beach with swimming-pool for children and camper service, inside parking, pullman parking, telephones, brickwork Bungalows with gas cooking and refrigerator for families. Moreover, the members of the Camping La Zagara are able to organise trips and excursions (for example to the Volcano Etna) with a wide choice of itineraries which will suit all requirements of holiday makers. Ideally situated within walking distance of only 10 metres from the sea, the camping is located among citrus plants and so you can breath the delicious scent of Zagara that this plant lavishes generously all over the year. Born of a Giuseppe Gangemi’s far-sighted idea who, 40 years ago, believed in the opportunities of growing and developing of the open air tourism, the Camping La Zagara –during the years –has grown, offering always high quality services to its customers, from local campers to foreign tourists. Take the motorway A18 till Fiumefreddo exit, then go to Marina di Cottone beach, proceed to Riposto, go along the littoral road, go through Fondachello and after some hundred metres you’ll find the Camping La Zagara. The same itinerary if you come from SS.114. 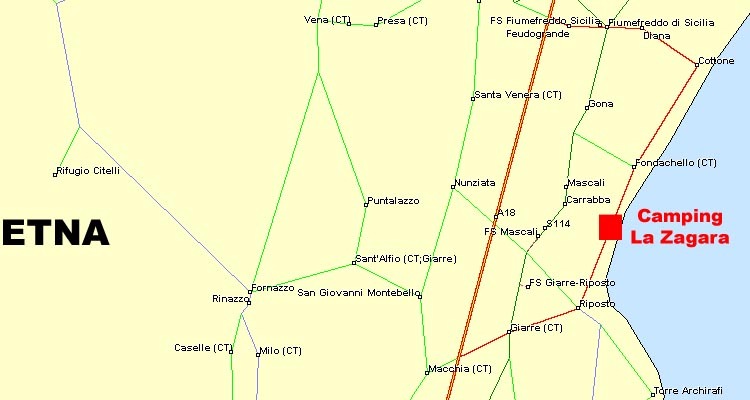 Giarre-Riposto railway station, then take the littoral road Riposto Fondachello, on the left – before Fondachello village – you’ll find the Camping “La Zagara”.